This document describes how to launch a web conference using Blackboard Collaborate Ultra in Canvas. Blackboard Ultra integrates with the Canvas Learning Management System. You can create web conferences that are accessible to anyone enrolled in your course using this integration. 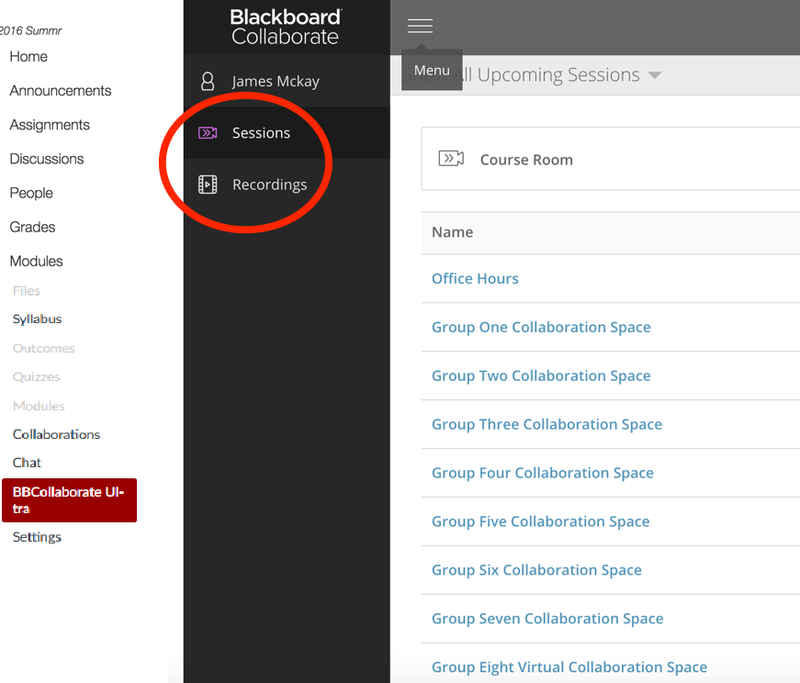 Any recordings you make using Blackboard Ultra will also be available to those enrolled in the class. As an instructor, you can access the Ultra admin interface, by clicking BBCollaborate Ultra in the course navigation bar. To create a new session, click on the plus sign in the upper right hand corner. To join a session, simply click on its name (red arrow). To access any recordings, click on the menu button in the top left corner (underlined in red), this will reveal a menu that allows you to toggle between sessions and recordings.